This star-studded release is a collection of music written and performed by a constellation of today's leading female artists, celebrating the contributions of phenomenal women to the past, present, and future of American music. 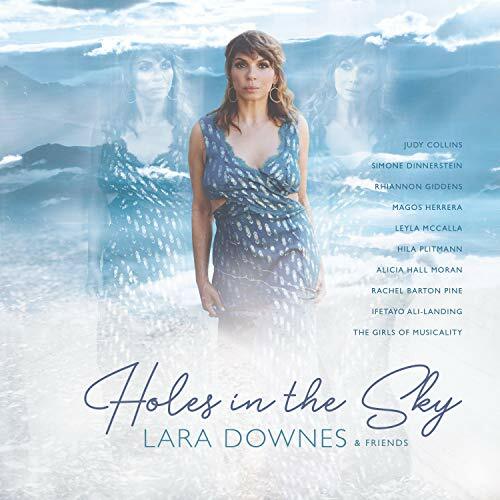 Lara collaborates with an extraordinary multi-generational group of female guest artists on this album, including the iconic singer / songwriter Judy Collins, boundary-breaking violinist Rachel Barton Pine, singer / instrumentalist Rhiannon Giddens (2018 MacArthur Fellow), pianist Simone Dinnerstein, fast-rising cellist Ifetayo Ali-Landing, and the urban youth vocal ensemble Musicality. This music tells the story of what women and girls can contribute to the world when they are given a chance - their dreams can make holes in the sky. The album is presented in support of PLAN International Because I Am A Girl, supporting the rights and empowerment of girls and young women around the globe, Women’s Empowerment, ending homelessness one woman - and one family - at a time, the Los Angeles Downtown Women’s Center, and The Lower Eastside Girls Club of NY, creating the next generation of environmental, entrepreneurial, and ethical leaders. Pianist Lara Downes leaves no room for doubt. Given the choice as a professional musician to rant about male composers' dominance in music history, the repertoire of orchestras, chamber ensembles and soloists, and jazz, pop, funk, R&B, folk, and other playlists, or to rave about brilliant, overlooked women composers, Downes chooses the latter. WASHINGTON - For centuries, the world of classical music has been a proverbial boys club: Bach, Mozart, Beethoven, Chopin, Tchaikovsky, Gershwin, Herrmann, Bernstein, Williams. Now, it's the ladies' turn with "Holes in the Sky," a pioneering national tour that launches this Saturday night at Sixth & I in Chinatown presented by Washington Performing Arts. Welcome to Major Themes, a monthly feature in which classical music experts recommend a must-hear recording based on what's happening at classical stations and programs around the country. This month, we checked in with friends in Michigan, Tennessee, Vermont and California, and the national program Pipedreams . The Renowned pianist Lara Downes is back in Sacramento to tell us about her benefit concert tonight for Women's Empowerment! Creative programming is a hallmark of Sacramento-based and internationally acclaimed concert pianist Lara Downes. In her concerts and on her recordings, Downes draws from wide-ranging sources to address a common theme. On her latest CD, "Holes in the Sky," that theme is both universal and deeply personal. With a singular mission to expand the music universe for diverse audiences, ground-breaking pianist Lara Downes will be gracing DC's Sixth & I Historic Synagogue stage in a live event co-commissioned by Washington Performing Arts. It will be an intimate evening of solo and ensemble work like no other.